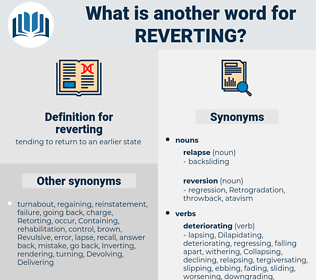 What is another word for reverting? 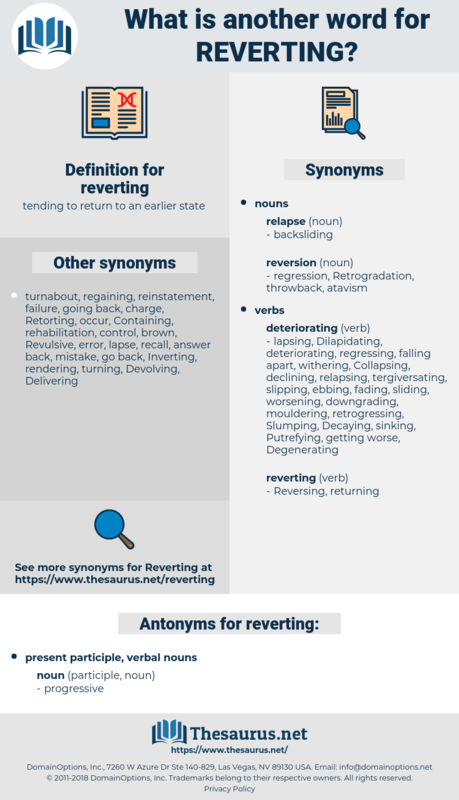 revisiting, reactivating, re-establishing, reviving, reinstating, revitalizing, reintroducing, Rehabilitating, reconsidering, reinvigorating, reestablishing, recovering, re-instate, Re-entering, Resorting, resetting, Reversing, Reiterating, departing, Resuming, reopening, regaining, withdrawing, altering, reshaping, rebuilding, reneging, turning, Referring, backtracking, Devolving, redressing, relapsing, Replying, recalling, switching, rebounding, moving, Accruing, Overcoming, coming, changing, becoming, shifting, Commenting, rolling, homing, dropping, back, backing, looking, going, falling, passing, getting, making, reverse. I begin to believe I am reverting to type, as McPherson would say, and I'm intensely interested in finding out - what type? She felt more normal then, but when these reflections had died away, she still occasionally felt her thoughts reverting to Mac's warning, the cigarette ash, the averted glances in the office.